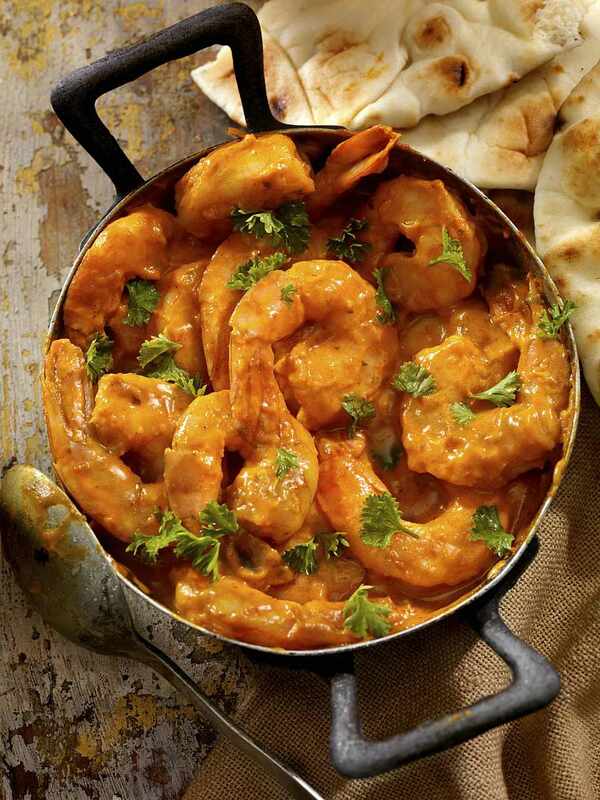 This creamy prawn curry is a north Indian delicacy eaten with traditional jeera rice. Sometimes called Chingri Malaikari, or Malai for short, this is now eaten throughout India and around the world. The prawns are cooked in a thick coconut milk gravy with whole spices for a strong, flavorful dish. You will find prawn Malaikari a part of the menu in many Bong (Bengali) parties in the U.S. Grind the onions, tomatoes, and green chilies into a fine paste in a food processor. Heat the oil in a pan and add the paste. Fry for a minute. Add the ginger paste and garlic paste and fry for another minute. Add the garam masala, coriander, cumin, and the chili paste and cook until the oil begins to separate from it. Add the coconut milk and bring to a boil. Add salt to taste. Add the prawns and cook for another 2 minutes. Turn off the fire and stir in the cream. Garnish with coriander leaves and serve with jeera rice or plain boiled rice. If you cannot find prawns at your fish market, you can substitute with shrimp. Although technically not the same animal, and shrimp live in saltwater while prawns dwell in freshwater, the two crustaceans are interchangeable in recipes as their taste is often similar. Since this recipe calls for large prawns, make sure to substitute with larger sized shrimp. Single cream is a common ingredient in the UK but not readily available in supermarkets in the United States. British single cream has about 18 percent fat while half-and-half runs between 10 and 18 percent and light cream is anywhere from 18 to 30 percent fat. Choosing either as a substitute for single cream should do the job. If you are looking to be a bit more precise, you can combine 4 parts half-and-half with 1 part heavy whipping cream. For added flavor, prepare prawn malai with half of the prawns with the heads and half with the heads removed. The prawn head adds a fourth dimension of seafood flavor to this already delicious preparation. If you are not used to preparing prawns, you may not want to include any with heads, as prawn heads have to be delicately cleaned before cooking. Another way to switch up the flavor in your prawn malai curry is by bringing a nutty taste to the dish. Include a tablespoon of cashew paste as well as a 1/2 cup of freshly grated coconut. Add both just after putting the ginger and garlic pastes into the pan.